Implementation of proper Health Safety and Environment - HSE Management System protects workers, the environment and the public from harm. It improves business, often having a positive effect on investment, sales growth, competitive advantage and continuous improvements. To understand Health Safety and Environment Management System awareness as well as internal audit as per ISO 14001:2015 and ISO 45001:2018 standards requirements, Global Certification Consultancy has designed HSE awareness and internal auditor training presentation kit. We also offer HSE certification consultancy for implementation of integrated environment and occupational health safety management system in any size and type of organizations. Our consultancy services include implementation of HSE system, documentation as per HSE certification requirements as well as awareness and auditor training to all employees of the organization. Our HSE certification consultancy and HSE auditor training kit is beneficial for companies that want to implement the HSE system and get certification as per ISO 14001:2015 and ISO 45001:2018 from international certifying bodies. This HSE System Awareness & Auditor Training Presentation Kit is prepared by a team of highly qualified management professionals and experienced consultants having rich experience of implementation of EMS and OH&SMS, internal audit and certification as per ISO 14001:2015 and ISO 45001:2018 requirements. Our kit, which is designed in completely editable ppt slides and .doc formats, can be used as a training material for HSE awareness and internal auditor. It is a very useful tool while conducting corporate training on health, safety and environment management system within the organization or any work area. 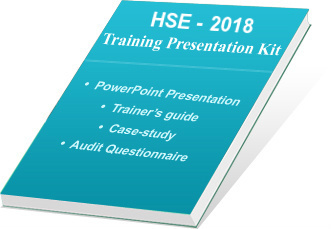 Our HSE training presentation kit contains more than 410 slides of ppt presentation and handouts of literature for participants. These handouts aid further learning and understanding of participants. Our HSE training kit is written in easy-to-understand language. Handouts are written in MS-Word 2007 and Presentation Slides are prepared in PowerPoint 2007. The entire HSE auditor training kit has been developed under the guidance of experienced experts and globally proven consultants. Many companies are implementing HSE and getting benefits of ISO 14001, ISO 45001 integration certification as an improved HSE in day-to-day business. In the preparation of training kits, the content has been verified and evaluated at various levels of our team. More than 1000 hours are spent in the preparation of this HSE training presentation kit.